Many people think of the Smart Grid as a power distribution group built on advanced smart metering—but that’s just one aspect of a much larger and more complex system. The "Smart Grid" requires new technologies throughout energy generation, transmission and distribution, and even the homes and businesses being served by the grid. This also represents new information paths between these new systems and services, all of which represents risk, requiring a more thorough approach to where and how cyber security controls are implemented. 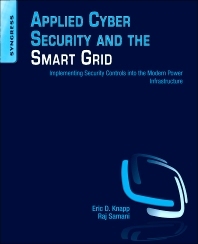 This insight provides a detailed architecture of the entire Smart Grid, with recommended cyber security measures for everything from the supply chain to the consumer. This book is be geared toward Control Systems operators and IS and IT professionals who are trying to apply security controls to the complex and rapidly evolving Smart. Chapter 1. What is the Smart Grid? Eric D. Knapp is a globally recognized expert in industrial control systems cyber security, and continues to drive the adoption of new security technology in order to promote safer and more reliable automation infrastructures. He firsst specialized in industrial control cyber security while at Nitrosecurity, where he focused on the collection and correlation of SCADA and ICS data for the detection of advanced threats against these environments. He was later responsible for the development and implementation of end-to-end ICS cyber security solutions for McAfee, Inc. in his role as Global Director for Critical Infrastructure Markets. He is currently the Director of Strategic Alliances for Wurldtech Security Technologies, where he continues to promote the advancement of embedded security technology in order to better protect SCADA, ICS and other connected, real-time devices. He is a long-time advocate of improved industrial control system cyber security and participates in many Critical Infrastructure industry groups, where he brings a wealth of technology expertise. He has over 20 years of experience in Infromation Technology, specializing in industrial automation technologies, infrastructure security, and applied Ethernet protocols as well as the design and implementation of Intrusion Prevention Systems and Security Information and Event Management systems in both enterprise and industrial networks. In addition to his work in information security, he is an award-winning author of cition. He studied at the University of New Hampshire and the University of London. Raj Samani is an active member of the Information Security industry, through involvement with numerous initiatives to improve the awareness and application of security in business and society. He is currently working as the VP, Chief Technical Officer for McAfee EMEA, having previously worked as the Chief Information Security Officer for a large public sector organisation in the UK and was recently inducted into the Infosecurity Europe Hall of Fame (2012). He previously worked across numerous public sector organisations, in many cyber security and research orientated working groups across Europe. Examples include the midata Interoperability Board, as well as representing DIGITALEUROPE on the Smart Grids Reference Group established by the European Commission in support of the Smart Grid Mandate. In addition, Raj is currently the Cloud Security Alliance’s Strategic Advisor for EMEA having previously served as the Vice President for Communications in the ISSA UK Chapter where he presided over the award of Chapter Communications Programme of the Year 2008 and 2009, having previously established the UK mentoring programme. He is also on the advisory council for the Infosecurity Europe show, Infosecurity Magazine, and expert on both searchsecurity.co.uk, and Infosec portal, and regular columnist on Computer Weekly. He has had numerous security papers published, and appeared on television (ITV and More4) commenting on computer security issues. He has also provided assistance in the 2006 RSA Wireless Security Survey and part of the consultation committee for the RIPA Bill (Part 3).